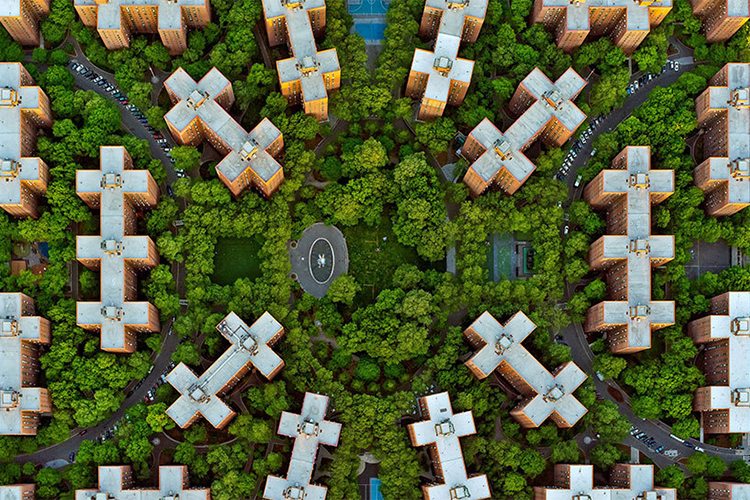 An exhibition opened this week at New York's Benrubi Gallery which displays Jeffrey Milstein's stunning aerial shots of New York. Milstein said in an interview with the Telegraph: "My earliest aerial photographs were taken while flying a rented Cessna 150 around Los Angeles as a teenager." "I was fascinated by how everything looked from above." "I was interested in documenting the patterns, layering, and complexity of cities, highlighting airports, container ports, recreational facilities, and residential and commercial developments, all of which grow organically over time and are connected by roads and arterial highways like a living organism." Milstein has also captured other such serene and geometric views of Miami and Los Angeles. Jeffrey Milstein: NY LA will be at Benrubi Galler, New York until August 22. Kopeikin Gallery, Los Angeles, July 18–August 22.